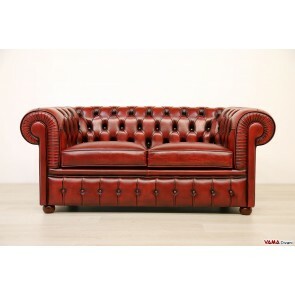 Chesterfield 2 and 3 seater sofas, upholstered in leather and available even in custom sizes. A real and original Chesterfield sofa is entirely made of leather, but you can choose to upholster it even in faux leather or fabric. Its structure consists of solid fir wood with high resistance and elastic belts which can be replaced by hand-tied steel springs. The padding is made in polyurethane foam with different densities. The inner side of the seat cushions is made of polyurethane foam and it can be replaced with a internal padding consisting in a core of polyurethane foam wrapped in a stuffed envelope including soft goose down, or in a cushion of goose down and synthetic fibres. The Chesterfield sofa is perfect for any kind of furniture solution, both modern and classic ones, and if you do not find the right size for your room, feel free to contact us for realising your Chester Custom sofa. 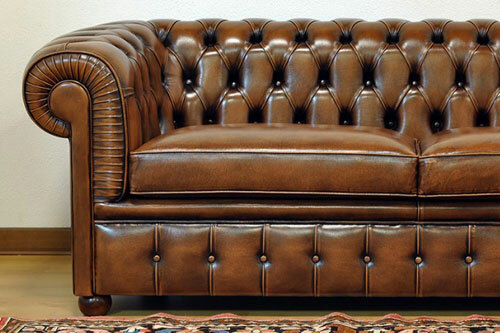 The main features of the Chester sofa are the hand crafted buttoned details both in its arms and in its seat back without divisions, a genuine process that can only be realised by a skilled craftsman. This type of padding comes from the fact that, in England, the Chesterfield sofas are also known as British sofas. In the pictures of the details that you will find in the pages of each model, you can see the top-quality finishing and our attention to detail. 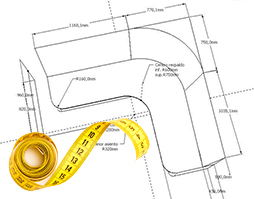 Right inside each page, you can also find dimensions and prices of our products. 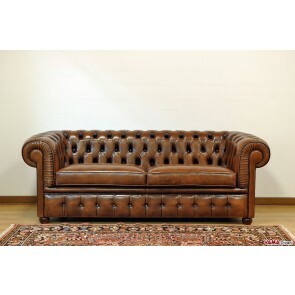 For example, if you are looking for a Vintage Aged Leather 3 seater Chesterfield sofa, it is 220 cm long. While, if you want to calculate the shipping costs for your area, you can contact us or use the calculator built into every page of our Chesterfield sofas. Chesterfield 3 seater sofa, 220 cm long, characterised by a typically Vintage style, a version of a great stylish classic sofa, perfect for traditional spaces. If you want to know the price of the Chester 3 seater sofa, just select the type of upholstery from the menu next to the pictures. Chesterfield Large 2 seater sofa, 200 cm long, a true icon of classical look that faithfully reproduces the old style of this English sofa. The Chesterino sofa is the ideal solution for those who want to decorate a small room without losing style and elegance: despite having all the typical characteristics of the oldest Chesterfield sofa, indeed, this classic sofa features a less impressive size and it is only 140 cm long. 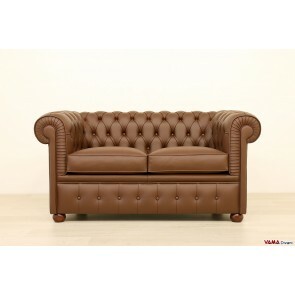 The Old Style Chesterfield sofa is a fine and impressive sofa, a piece of furniture that manages to capture the attention in any room is placed. This 3 seater version in high quality cream leather is 220 cm long, but it can even be realised in the 2 seater, armchair or customised version. 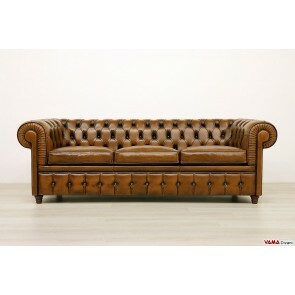 The classic Chesterfield sofa does not meet your needs for an exclusive and original living room? We realised the Mug Chesterfield for lovers of details and originality. Chesterfield white sofa (but available in many other colours) characterised by a quite impressive look, which is 106 cm deeper than the average and 260 cm long. Chesterfield chaise longue, 178 cm long, in pale blue leather but available in many other colours. A very original sofa and a very similar one to the famous Chesterfield sofa concerning its style, but with its particular oblique seat back which characterises a chaise longue. Chesterfield corner sofa that features all the characteristics of the old Chesterfield sofas while presenting an original corner shape. The fine and perfect buttoned details, the antique grain leather and many other accurate details realised by our Italian craftsmen, make this classic sofa an extraordinary piece of furniture. This beautiful Chesterfield corner sofa measures 280 x 230 cm; if you like a smaller, larger or a different one, VAMA Divani can even make your Chesterfield corner custom sofa. Feel free to contact us for a quote! Beautiful Chesterfield corner sofa with an impressive and very elegant style, which impeccably proposes all the features of the classic Chesterfield sofa, including the buttoned seat back, while presenting a so special profile. The rounded corner is valuable both aesthetically and comfortably speaking, allowing people who sit on the corner to rest on its seat back just as in all the other points of the sofa. It can be customised by VAMA Divani in different dimensions and features.